Test...Quiz...Exam...How do these words make you feel? For many, the mere mention of them is enough to conjure up feelings of anxiety, stress and pressure. You don't often hear people say, "I LOVE taking tests." At AIIM, we know tests can be downright scary. But, we also know the power of preparation and understanding. A lot of times fear comes from the unknown - in the case of a test, not knowing what to expect, not knowing if you're prepared, and just overall fear of failure from not knowing enough. Why choose certification? For me, it's about proof (to myself and to employers) of my expertise. The Certified Information Professional (CIP) started with a group of industry experts and focus groups that worked together to define the body of knowledge necessary for information professionals to be successful in the digital economy. From there, AIIM worked to build a certification exam based upon this body of knowledge - and the CIP was born. Fast forward to present day and the list of CIPs is growing daily and from all over the globe. I had a chance to sit down with one of our CIPs, Devon McCollum, Corporate Records and Information Manager for Members 1st Federal Credit Union. I wanted to pick his brain to see what advice and tips he had for others considering certification. I am pleased to announce that we have introduced another exam option for CIP candidates. To recap, there are now three ways you can take the CIP exam: At any Kryterion exam center world-wide. At an AIIM-taught CIP prep course. Online proctored via Kryterion. Online proctoring has been available for years, but has sometimes suffered from confusion with online certificate programs and the perception that "it's just an online exam." I've shared that sentiment myself; at the same time, I completed about 35% of my bachelor's degree online in 2001, and in 2018 there are any number of programs including master's degree programs that are 100% online. Digital disruption calls for digital leaders with the skills and experience to optimize information assets and transform business. The AIIM Certified Information Professional (CIP) designation has come to represent a badge of competency and knowledge for those entrusted with the task of building an information strategy. But, what do our CIPs say about the certification? How has it helped their work and impacted their career? On this podcast episode, Kevin sits down with three Certified Information Professionals to talk about about the certification, the benefits, the process, and their advice for those considering the CIP. [This is a guest post by Marko Sillanpaa. Marko is the founder of BMO Consulting. An organization that helps vendors and users navigate the ECM landscape. Marko’s has been working in the content management space for over 18 years. In the past, he was the Director of Product Strategy at Documentum, Enterprise Adviser at Hyland, and the Director of Global Services at TraDOS. He has also worked as a consultant for CSC, Accenture and regional system integrators.] Did any of us choose enterprise content management (ECM) as our career path when we joined the workforce? While there are degree programs in information studies, I think most of our paths were accidental. 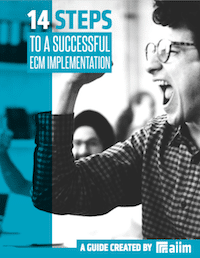 While we may have accidently entered ECM, the decision to stay has been our own choice. Still we often don’t look at ECM as our career, but at “computers” as our career. Yet I can hardly imagine a brain surgeon saying they were, “just a doctor.” I know I don’t want to keep being asked if I can fix someone’s printer. I think it’s time we own our career.